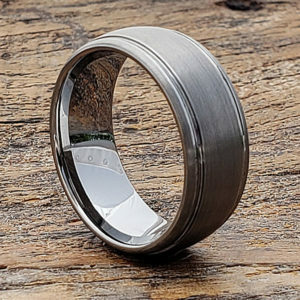 Forever Metals is a trusted supplier of tungsten wedding band in the USA. With our strict quality standards, eye for details and FREE lifetime, we are your best choice when you want to make your tungsten wedding bands to be extra special. Check out our wide range of tungsten wedding bands. Tungsten wedding bands were first launched as wedding band alternatives almost eight years ago. A lot has changed since then. Tungsten wedding bands have transformed from classic wedding bands to the intricately designed bands that we know today. Did you know that these tungsten wedding bands were made out of practicality? Tungsten carbide is one of the toughest materials around, making it the perfect material for couples with jobs in welding and construction. It is durable and reputed to be the most scratch-free material around. So, no matter how hot and busy it gets at work, you can rest assured that your tungsten wedding ring stays intact. Here’s how to choose the best tungsten wedding bands for you and your partner. Know what you want. Don’t go in there without an idea of the look and make of the tungsten wedding bands that are perfect for you and your partner. Because, you’ll find yourself swimming in so many tungsten wedding rings. So, do some research first. Talk to your partner. Would you like something simple? Or, do you want something ornate? Do you want a silver, metallic or gold colored ring? Do you want it to be made of gold, platinum or tungsten? Plan for your engagement and wedding ring at the same time. Many couples want their engagement and tungsten wedding rings to coordinate. These two rings are often worn side by side. So, how they look together matters. Do your ring search early. Give yourself about three months head start for the perfect tungsten wedding rings. Don’t be afraid to mix things up. So, you are eyeing a particular style while your partner wants another. Don’t worry! You can always mix things up. Braided wedding bands can be a good compromise. Have a budget in mind. It is best to have a budget in mind. Typically, tungsten wedding rings take about 3% of your overall wedding budget. Choose a ring based on your lifestyle. Keep in mind that you will likely wear your wedding rings all the time. Have your lifestyle in mind when you choose them. Your promise is forever so your rings should be too. While carving a Pokemon on your rings seems like a good idea now, think about the future when no one remembers what that is. Thirty years forward, classic designs and personalized carvings are the ones with the staying power. Keep this in mind when deciding on a design for your rings. Get rings that are right-sized. Our fingers swell and contract naturally, depending on heat, cold, weight and water retention conditions. So, get sized at the right time. Make sure that your body’s temperature is normal, and you’re calm and not retaining too much water. Know more about tungsten wedding bands and the many options that Forever Metals has for you. Your tungsten wedding rings are some of the best possible rings to pick to seal your commitment. Of course, because these rings mean forever, you should know how to properly care for them. Tungsten wedding rings are some of the toughest rings you’ll find but they’re sensitive to chemicals. So, your care should keep this in mind. A dirty tungsten wedding ring is easy to clean. All you need is soap and water. Place a few drops of your detergent into a bowl of warm water, and then soak your ring in it. In a few minutes, the dirt and grime will fall off. Sometimes, detergent and water might not be enough. In these cases, get a specialty tarnish remover that is especially made for tungsten wedding rings. This includes an applicator to use on your rings. After doing this, wipe off the ring with your buffing cloth. Proceed to the soap and water routine to finish off your ring care. You might experience false scratches on your tungsten wedding rings. False scratches seem like real scratches. In many cases, these scratches are just material residue from items your rings got in contact with. Often, simply rubbing your rings off with a buffing cloth works to remove these scratches. If not, proceed with using either soap and water or a tungsten ring tarnish remover. This is how you make your tungsten wedding rings last forever. Diligent care is all that you need. © 2005-2019 Forever Metals About Forever Metals owners Gary and Christine Camphausen and their quest to find high quality tungsten wedding bands.